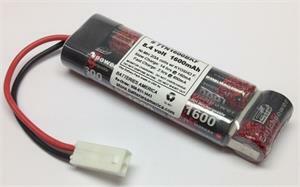 7TN1600BKF: 8.4 volt 1600mAh NiMH battery with Kyosho (mini Tamiya) connector - for Airsoft guns, RC hobby. Fits RC racing cars, sport cars, flying models. 7TN1600BKF : 8.4 volt 1600mAh NiMH battery with Kyosho (mini Tamiya) connector - for Airsoft guns, RC hobby. Fits RC racing cars, sport cars, flying models. Fits Airsoft electric guns such as Mini AK series, upgraded and/or modified AEG's. Fits in Classic Army P90, P90TR, CA90 AEG, CA049M airsoft guns. Dimensions of this battery pack are approximately 4" long, 1.4" wide, 0.7" thick. Weight is approx. 5 ounces. These battery packs are manufactured in the USA by Batteries America.